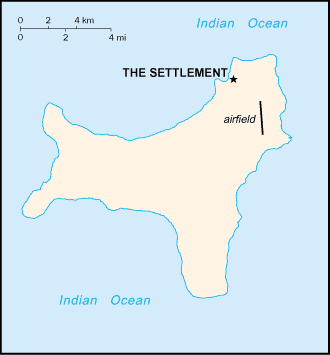 This article is about the Indian Ocean territory of Australia named Christmas Island. For the island of the same name also known as Kiritimati in the Line Islands of the Pacific Ocean, see Kiribati. Christmas Island  is one of the islands of the Indian Ocean, south of Indonesia and some distance northwest of Australia, of which it is a territory. Phosphate mining was the the reason for first settlement in the 19th century and is still a major contributor to the local economy. The island is also the place of entry for immigrants seeking asylum in Australia. Migrants from Southeast Asia make the journey by sea, often on rickety, over crowded boats that are weighed down with passengers and personal belongings. It is a dangerous trip and sometimes the boats capsize before they arrive. The Australian government operates a detention center on the island for these asylum seekers. There are two weekly flights from Perth, Australia with Virgin , who also offer two connecting flights to the Cocos Islands. Fares from about A$520 one way. Garuda Indonesia offers the only international flight on a chartered aircraft from Jakarta every Saturday. Tragically named after a girl who was swept off the rocks at the beach never to be found. The beach comprises a sandy area running down to a bathing pool, the pool is seperated from the open ocean by rocky basalt/limestone outcrops. The pool is constantly fed sea water from the gullies leading to the ocean and the whitewash generated from the waves hitting the cliffs and outcrop. View the spectacular world famous Christmas Island Red Crab Migration normally during the October - December months. The Island has "duty free" status, and shop prices for perfume and alcohol are very low compared to even duty-free shops on the Australian mainland. But when doing your groceries, double check for the expiry date mostly with the super cheap items. Expired items might gone for few months back. Mon - Fri :Fresh bread daily including white, wholemeal, wholegrain and rolls containing Kaya paste; Coconut and chicken sausage rolls. Thurs: Sticky Buns Sat :Closed but bread is still available from shops listed below. Sun: Fresh bread and french sticks Available from Boong Trading, Meng Chong Trading, and Metro Enterprises. Malaysian style breakfast - roti, mie goreng etc. Open for dinner on Thursdays. Cash only. Malay style restaurant. Open for roti breakfasts and dinners on Wednesday and Friday. Christmas Island District High School is the main school on the island, Year 1 to Year 12 is taught based on the Western Australian Curriculum. This page was last edited on 27 February 2018, at 23:10.